Märklin introduced their line of Gauge 1 trains in 1968. The Nürnberg firm of Ernst Paul Lehman introduced their line of large sized trains in 1968 also. To be sure, the two firms were competitors, with Lehman being on old-line toy manufacturer that had entered the model train business. Märklin was an old-line toy manufacturer that had been in the model train business for a much longer time. 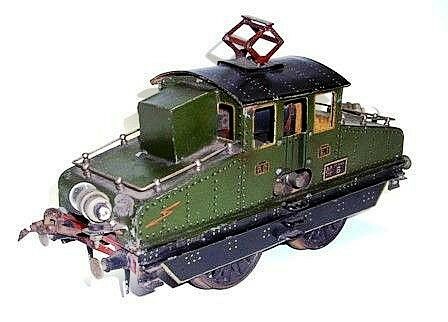 Märklin was the company that established the notions of “Gauges”, such a 0-Gauge, 1-Gauge, 2-Gauge all the way up to 4. Märklin had developed sectional track pieces and a number of other developments. Yet, in 1968, LGB had captured attention. Both Märklin 1 and LGB operated on 45 mm gauged track. And, it is there that the similarities ended. Märklin’s Gauge 1 operated with A/C power, while LGB used DC. Märklin’s Gauge 1 coupler in the 1960’s was essentially a large rapido style coupler. LGB used a loop and hook arrangement. Märklin was scaled to a 1:32 proportion, while LGB was scaled to a larger proportion, 1:22.5. Operating on 45mm gauged track, Märklin Gauge 1 trains were “standard” gauge. LGB trains, operating on the same 45 mm gauge track, but scaled to a larger proportion represented “narrow” gauge trains. Märklin Gauge 1 track used rails that were .197” tall, while the LGB track used rails that were .335” inches tall. This meant that Märklin trains could operate on LGB track but LGB trains could not operate on Märklin track. Perhaps the biggest issue in the mid-1970’s was that Märklin’s Gauge 1 product line had 3 locomotives and 12 cars, while LGB had 25 locomotives and 29 cars. This disparity was noticeable, but there is also a background explanation. LGB had one major product line, their G-Scale trains, whilst Märklin had three lines of trains (H0, Z and Gauge 1), a slot car line (Sprint), die-cast vehicles (RAK), metal construction sets (Metall) and the ill-fated Märklin Plus line of plastic blocks. So, Märklin’s Gauge 1 was competeing for attention against several different product lines. In particular, Z-Scale, Märklin mini-club, had been a spectacular success. LGB did not have that sort of problem, and was able to fully concentrate on their line of G-Scale trains. By the late 1970’s, however, Märklin 1 began to grow again with the addition of the 4-6-0 Class 38 steam locomotive. The line continued to grow in the 1980’s and is continuing in the same direction today. Starting with the Class 38 locomotive and the accompanying passenger cars that were announced at the same time, Märklin Gauge 1 has a “scale” emphasis, with these trains being well detailed standard gauge trains. The LGB trains are good representations of Gauge II narrow gauged trains. In the fullness of time, Märklin would eventually buy LGB from the Richter family, and a number of other events would push and shove these product lines in the direction of today. They’re both good lines of trains, but it’s hard to imagine one without the presence of the other. They both needed a second line of large scale trains to lend credibility to the large scale train market, which existed only in tiny quantities prior to 1968. And, a good deal of those early large sized trains were sitting on collector’s shelves. LGB was successful on a variety of levels, most particularly in capturing the hearts of North American garden railway operators. And a number of other companies joined in as a result. I personally prefer the Märklin Gauge 1 trains, but I do have a number of LGB locomotives and cars. When I get around to doing a small garden railway, it will use LGB track, since I can operate all brands of large scale trains on those rails. The whole model railroad hobby benefited from the competition between these two companies.